MP Mike Hill and members of UNISON were among those at an event to celebrate 70 years of the NHS. 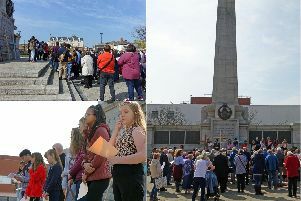 Well-wishers gathered in Hartlepool to toast the NHS on its 70th birthday. In a special event, hosted by Hartlepool Borough Council, people gathered from across the organisation to celebrate and talk about the vital role of the NHS. One of the guest speakers was the town’s MP, Mike Hill, who said he enjoyed speaking at the event and it was good to hear so many strong opinions. Brought together by several organisations in the town, the event on Thursday evening was the perfect opportunity to celebrate the achievements of one of the nation’s most loved institutions and to appreciate the vital role the service plays in everyone’s life. It was also an evening aimed at recognising and thanking the extraordinary NHS staff – the everyday heroes – who are there to guide, support and care for people, day in, day out. Hartlepool’s Civic Centre was the venue for the event, which included a number of speakers and guests from NHS institutions, and lots of birthday cake. It was open to the public and many members of the community went along to show their appreciation for the work everyone in the NHS does. Counc Christopher Akers-Belcher, leader of Hartlepool Borough Council and chairman of the town’s Health and Wellbeing Board, was among those who took part in the celebration event and was a speaker. He said: “The NHS plays a vital role in our lives and is one of our nation’s most loved institutions, and its 70th birthday was the perfect opportunity to thank the extraordinary staff who care for us day in and day out. Hartlepool Borough Council leader Christopher Akers-Belcher. Along with Mr Hill and Coun Akers-Belcher, other speakers on the night included, Dr Deepak Dwarakanath, trust medical director, North East and Hartlepool NHS Foundation Trust, Dr Boleslaw Posmyk, GP and chairman of Hartlepool and Stockton-on-Tees CCG, Dr Nick Timlin, GP and locality lead at Hartlepool and Stockton-on-Tees CCG), Gordon Lees, Royal College of Nursing Council member and Coun Mike McLaughlin, Specialist A&E Registrar.